This business truly has it all. 2018 might have been a down year for the S&P 500, but investors in Adobe Systems (NASDAQ:ADBE) didn't experience any pain. Shares of the digital media powerhouse were up 29% for the year, which is a return that smashes that of every major index. I don't think that 2018 was a fluke. Instead, I firmly believe that Adobe is one of the best stocks that investors can buy right now and hold for 2019 and beyond. With a market cap that currently tops $110 billion, Adobe is one of the largest software companies in the world. Adobe splits its business up into its two main business divisions: digital media and digital experience. Digital media is the division that most people are familiar with. This business contains houses several of Adobe's flagship products such as Photoshop, Illustrator, Premiere Pro, Acrobat, and more. These products are sold through the company's Creative Cloud offering using a software-as-a-service model. Many of these products are considered to be the gold standard in the creative community and are known by millions of designers, photographers, videographers, and animators. Adobe's digital experience division consists of products and services that help customers gain business insights. Through products like Adobe Marketing Cloud, the Adobe Analytics Cloud, and the Adobe Advertising Cloud, customers can create marketing campaigns and manage their advertising spend across a number of formats. Adobe has been spending lavishly in recent years to build out its digital experience business. The company recently acquired Magento and Marketo, which helped to boost its presence in the e-commerce and business-to-business services segment. Both of these business segments have been posting strong growth for years as the world continues to conduct business online. Adobe sold its software under a traditional licensing model for many decades. However, in 2012 the company decided to switch its business to a software-as-a-service model and moved all of its products to the cloud. That decision didn't sit well with some of its users and caused the company's revenue and profits to take a short-term dive. ADBE Revenue (TTM) data by YCharts. While the transition was painful, management felt that it would pay off in the long run for investors because the majority of the company's revenue would become recurring. That transition proved to be a stroke of genius and has paid off hugely. More than 90% of Adobe's revenue is considered to be recurring, and the company's sales and profits have more than fully recovered from their lows. Wall Street has responded by bidding up Adobe's stock by more than 280% over the last five years. 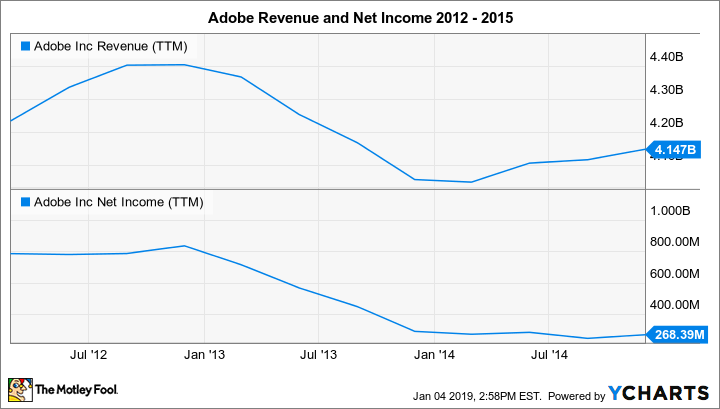 Adobe's recent quarterly results help to prove that it is still on the upside. Revenue jumped 23% to $2.46 billion, and net income soared 35% to $678 million. The gains were driven by a 23% gain in digital media revenue and 25% growth in digital experience. Wall Street expects more of the same over the next five years as the business continues to attract new users and expand its relationship with existing ones. Current estimates call for profits to grow in excess of 22% annually. That's an impressive number for such a large business. A quick glance at the company's ratings on Glassdoor suggests that Adobe is a fantastic place to work. Roughly 85% of employees would recommend the company to a friend, and the business gets 4.3 stars out of five. CEO Shantanu Narayen also boasts a 96% approval rating on Glassdoor and came in 13th place overall on the site's list of top 100 CEOs. This wasn't a fluke, either, as the company has won an award as "best place to work" in each of the last five years. In fact, the only knock that I have against Adobe is that its inside ownership isn't as high as I'd like it to be. Insiders as a whole control less than 1% of shares outstanding. I'm willing to give Adobe a pass here because of its great Glassdoor ratings and the fact that CEO Narayen owns nearly 300,000 shares of its stock. That's worth $68 million at current prices, which isn't chump change and should be big enough to give him extra motivation to make company stock increase in value. With a dominant market position, a great culture, flourishing financial statements, and strong growth ahead, Adobe checks nearly all of the boxes that I look for in a great business. With shares currently trading for less than 24 times forward earnings, I can't help but think that Adobe Systems is a great stock for investors to buy today and hold long term. Check out the latest Adobe earnings call transcript.